Filmmaker Bjarne Salen, producer of the acclaimed 2015 film Eclipse, has recently announced that he will be producing a ski documentary to be released fall 2017 called Finding the Line in which he will follow two sisters and ski athletes Nat and Anna Segal in their search to understand fear. The Segal sisters will use snowy mountains and big lines as backdrops to explore the subject of fear and how it affects them in their pursuit of professional skiing. And Salen is excited about the opportunity to tell a story that strays from the standard ski film. As sisters, Nat and Anna have dealt with fear together throughout their lives; Nat as a professional freeride skier and Anna as a professional slopestyle skier. Nat’s many achievements have included competing on the Freeride World Tour with many podium finishes, and Anna has the lofty success of making it to the 2014 Sochi Winter Olympics. These ladies have had many encounters with scary situations, and while sometimes the setting is a big mountain or half pipe, sometimes it is something as mundane as the halls of University. While the psychology of fear differs between these siblings, both are looking forward to the opportunity to use each other to push boundaries and explore their capabilities. For Salen, fear will give the film a story line that will speak to everyone and will allow him to delve into the nuances of this common human emotion. 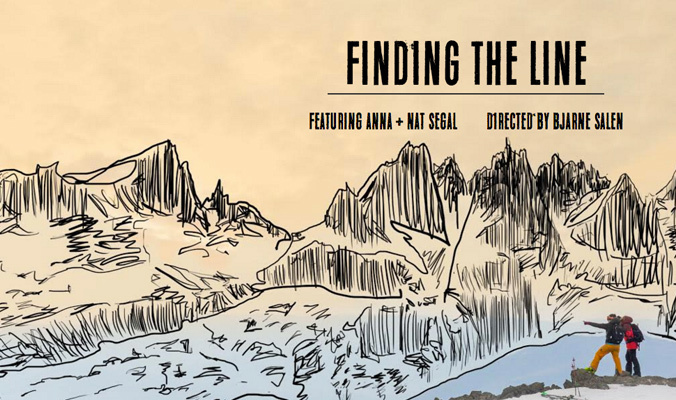 To find out more about Finding the Line, visit findingthelinefilm.com.